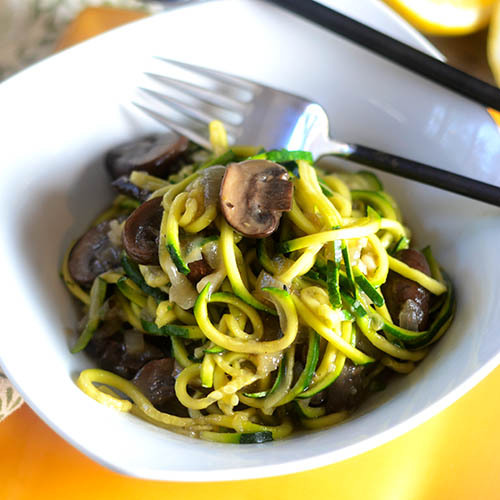 I purchased a spiralizer from Amazon and it has been perfect for my consumption of low carb veggies, easy to use, no electric needed just turn that handle and then create noodle dishes that are healthy and full of flavor. Experiment and create your own. This one is one of my favorites and I am a garlic freak. Add onions, crushed garlic, and cook for 4 to 5 minutes, or until translucent and tender. Stir in zucchini, butter, mushrooms and continue to cook for 2 minutes. Add Tsang sauce and Beijing sauce and sesame seeds; mix and continue to cook for 5 minutes, or until zucchini is tender.